This design is great for anyone who loves a bright pop of color in their life! Put it on a shower curtian, a purse, and more! Brighten up your life with this happy design! This design has a beautiful suzani floral pattern for the background. The colors in the background are white, hot pink, and lime green. These colors look super cute together. There is a lime green ribbon with a hot pink fram on top. Inside the frame is where your personalization goes. 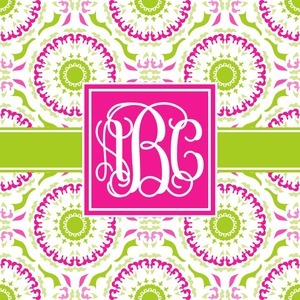 Put text or your initials for a monogram. In the design center you are able to change whatever you want. Change the background, ribbon, frame, text, and more! Have fun designing!